We have been trying out the new Sky Q system at home for a couple of months now and I cannot imagine what life was like before. We used to have a TV, Broadband and phone package with a Sky competitor before and although I loved the broadband speeds the TV system was slow, the remote control was frustrating and I could never find anything to watch. It was hugely frustrating. Sky Q has changed our lives. Not to mention the broadband speeds are still rather quick. Firstly, the installation was easy and seamless. Obviously I had to set up my series links to record again, but I didnt miss out on anything I had stocked up in my old TV system. The way Sky Q works, it is so easy to search for TV shows or movies that I just picked things up that I needed to catch up on and press record. Easy. The Sky Q engineer was so friendly, he spent the best part of an hour setting up our Sky dish, the main box, the two mini boxes and my iPad. When he left the house I was all ready to go with my new whizzy Sky Q controller. Tip: When making the change from Sky or any other provider, make sure you have watched all of your recordings. They will not transfer over to your new box. Sky Box Sets and the majority of BBC or ITV programmes for example can be picked up easily on your new box. What’s different about Sky Q? Where do I start? The layout of the system is completely different, it is so much easier to navigate your way around the TV Guide, Sky Cinema or recordings for example. It groups things better, you can see the thumbnails of the programs instead of one long list. This makes it easier for the children to pick the things they want to watch. They can use it as well as the grown ups. They have even sussed the YouTube app, they choose YouTube and are away watching their Hot Wheels videos. The remote controls are different, the main controller is so much easier to use. It’s a little different to any other remote, quite sensitive when you first start using it too. But once you get used to it, you will not want a “normal” controller again. You can start watching something in one room, pause it and pick it up elsewhere. Whether that be in another room or on your iPad. I have to do this quite often, as if the children run in and want to watch a cartoon or something I get bumped off the sofa! I don’t mind though as I can watch my things on the iPad when I prepare meals or doing the ironing. Tip: Don’t forget to use the search button on the top right hand of the control. You can search for shows and movies so quickly. It saves a lot of time searching through categories. The iPad app is brilliant, it doesn’t have the exact functionality that the actual boxes do but enough to allow you to watch your recordings and watch any On Demand shows or movies. They set up the iPad before they left my house, so it was all ready to go. I can watch anything on the device I like. The fact I can watch my recordings on the iPad is such a step forward to what I was using before. Its very clever. Tip: When heading out for a trip somewhere, download shows or movies on your iPad when you are at home. Then you can watch them on the go, anywhere, as they do not need a signal. Remember to watch them within 48 hours though! So far I have watched Elementary, Oz and I am making my way through Wayward Pines in Sky Box Sets. The great thing about Sky Box Sets is as you watch one episode, the next one downloads ready and you can watch and watch for hours. I seem to get through a lot more shows as I can pick them up where ever I want to watch them. I love that. Oz was a great watch, a bit gruesome in places, but an old show beginnging in the late 90’s. It is all about a prison, an experimental prison. A lot of violence, but it was a great eye opener into what prison life is like and death row. Definitely worth a watch if you like that kind of thing. Elementary is incredible, gets your brain working and if you like detective stories you will love it. Especially if you like Sherlock Holmes. And Wayward Pines is a great show, a bit out there and to be honest I cannot say anything about this without ruining the story lines. It’s got so many twists and turns, you cannot keep up! Only watch this if you have a good imagination and if you like Sci Fi shows. 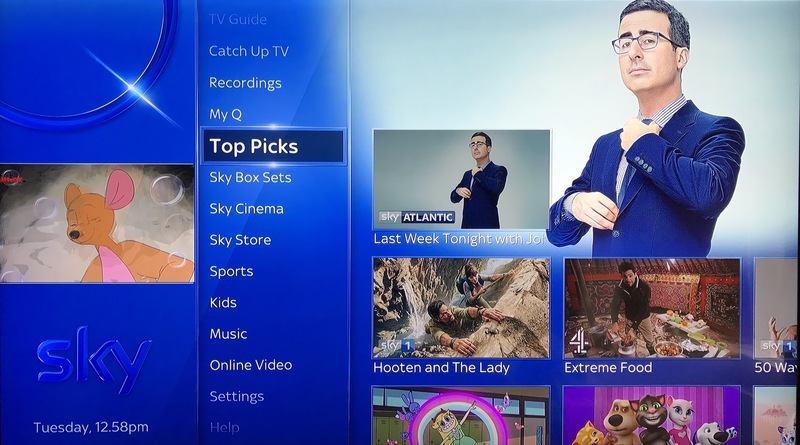 Tip: Use the Top Picks area on your box, Sky Q recommends things for you to watch based on what you have been watching. I have found out about a lot of great shows and movies from this area.